My daughter and I just returned from an invigorating early morning hike to Little Si. What did we see at the top? 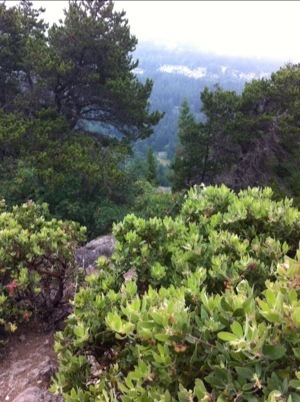 Manzanita, squirrels and fog. It was nice. what a lovely view for a walk! It looks lovely up there. Are those berries edible? Have never heard of them before. Yes, the berries are said to be edible, although I can’t remember ever eating them. It was fun to see so many of them at the top of Little Si. 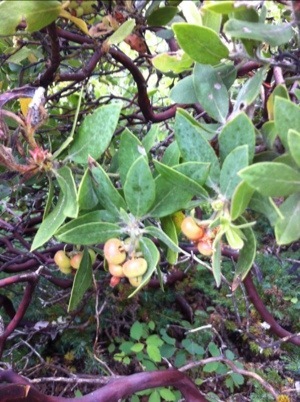 I originally thought they were Serviceberries, but have since discovered the truth….manzanita (Arctostaphylus columbiana). Ooops! Always learning!